This past autumn I became the proud owner of my very first bundt pan and began searching around for a great recipe to break it in. As it turned out, I didn't have to go much further than one of my favorite bloggers, Anuradha from Baker Street. I've long been a fan of her tasty looking baked creations and have even tried a few of the recipes. And so, I made her fabulous chocolate pumpkin bundt and it kick-started my bundt baking adventures. I hope you enjoy this cake and stop by the other participating bakers to see all the citrus deliciousness. Preheat the oven to 350 degrees and butter and flour a 12 cup bundt pan. In a bowl, combine the flour, baking powder, baking soda and salt. In a separate bowl, beat together the butter, sugar and lemon zest. When that has been creamed, add in the eggs, vanilla, lemon juice and sour cream and beat until combined. Working in batches, add in the flour mixture until everything is combined. To assemble the cake, spoon half the streusel into the bundt pan, pour half the batter over it, spoon in the remaining streusel and finish with the remaining batter. Bake for 50 - 55 minutes or until a cake tester comes out clean. Allow the cake to cool thoroughly before turning it out of the pan and dust the top with powdered sugar. Makes approximately 10 servings. - Follow Bundt-a-Month on Facebook at http://www.facebook.com/BundtaMonth where we feature all our gorgeous bundt cakes. Or head over to - our Pinterest board at https://pinterest.com/bakerstreet/bundtamonth/ for inspiration and choose from over 350 bundt cake recipes. YAY for your new bundt pan! I remember how well your pumpkin chocolate cake turned out! So excited you could join us this month, Anita! 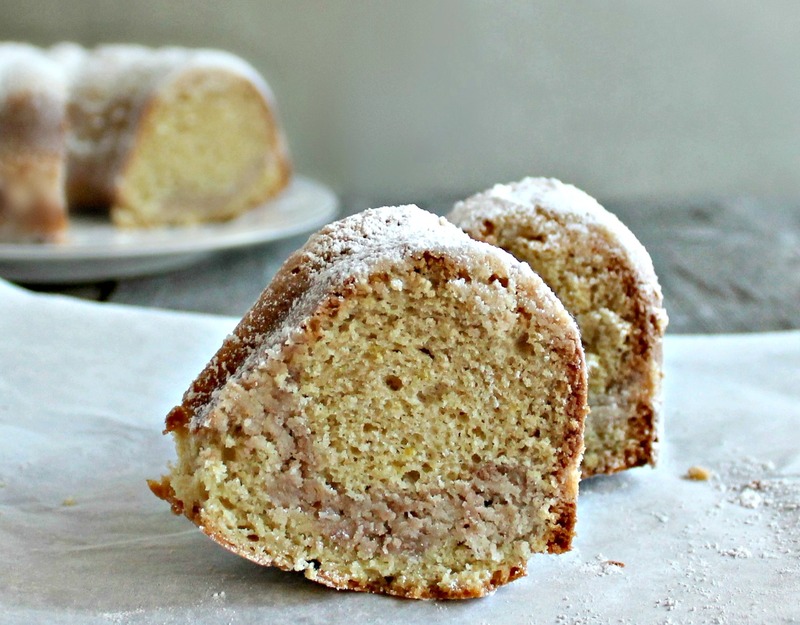 Your zesty lemon bundt sounds fantastic. I love the streusel topping! I adore lemony desserts! I need to use my bundt pan more often! Good thing you got your bundt pan, this cake sounds and looks so good! I like the fact that it kind of melted inside the cake. I'm on a lemony high right now. This looks SOOOOO good. I am a fan of streusel, especially in a Bundt! Your cake looks delicious! I'll bet it was lovely and tender too with all that sour cream. Yum! Layers of streusel in a citrus cake... I love that! This has got to be one seriously delicious cake. I don't think there's anything better than a bundt cake! It's the perfect snack, coffee dunker, peanut butter holder, and hot buttered lover. I adore a lemon cake and this one with a streusel topping as well? I'm in heaven! This cake sounds so flavorful and fragrant. Love it! Any cake with streusel is after my heart and tummy. No one would mind if I cut that part of the cake off and keep it for myself, now would they? I'm so glad you are joining in the #BundtAMonth fun. Bundts are my favorites and yours looks like one slice might not be enough. Every month I say I'm going to join the group and this would be a great time to start. Well I'm in cake heaven right now! Even though I never could cook much, I have made more than my share of bundt cakes and have several different bundt pans. My daughter dislikes icing or frost of any kind and no fan of ice cream either so I've been making bundt cakes for her birthday and other special occasions for 30 years. I can wait to go look and pin many of these especially ours - love lemon!! I just love anything lemon. Your bundt cake looks awesome!! Love the flavor ribbon inside. I have lots to learn but I am thrilled to be here with this new group. Your cake looks divine!! 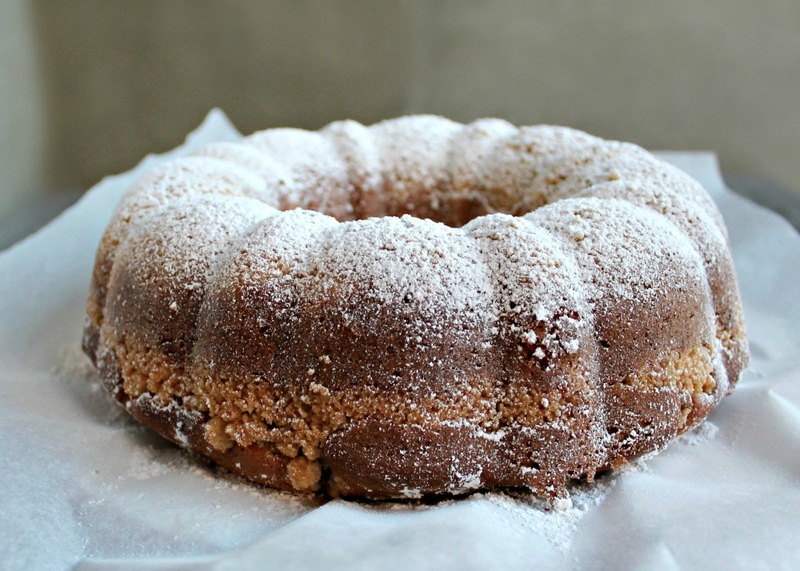 Your Bundt pan has certainly been put to good use, this cake looks wonderful! Your bundt looks great! Very elegant and beautiful! 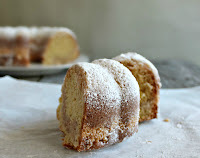 Love how you made this lemon bundt with a streusel in the cake, great idea, love it! Probably one of my favorite things about bundt cake is the surprise swirl filling in the inside! I've been making a Sour Cream Streusel Bundt Cake for the holidays, but never thought to add different flavors to change it up a bit, until now. Your Lemon Bundt Cake is gorgeous. I will definitely be experimenting soon. What a beautiful bundt cake and yay for bundt pans! Thank you for sharing with me. This post, along with my cup of hot chocolate, is making for a very lovely Thursday morning. Have a great weekend! That flavor ribbon is crazy! It was the first thing I noticed in the picture.... of course aside from the beautiful shape of your bundt, wink! this bundt cake puts me in such a happy mood...lemon is such a mood booster, and yours looks and sounds phenomenal! This is one beautiful bundt! Mmm, I love all of the lemony goodness. Delish.